Unlike any other hoofcare product on the market, Wunder Hoof is absorbed quickly and easily into the skin, naturally stimulating hoof growth and improving the overall condition of the hoof. Wunder Hoof’s pain relieving and anti-bacterial qualities promote healing and improve soundness to hooves. Wunder Hoof is free from irritating ingredients and will not cause blistering. Wunder Hoof is not just for hooves. Wunder Hoof also aids in the treatment of scars, saddle sores, scrapes, scabs, small cuts, and arthritic and sore joints. 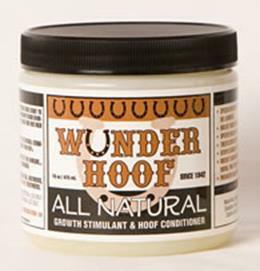 Wunder Hoof also improves hair growth and repels insects from treatment area. Massage Wunder Hoof directly into the coronet band, one inch above and below the hairline completely around the hoof, including the bulbs of the heel. May also be applied to the sole of the hoof and hoof wall. Apply Wunder Hoof by hand or brush once daily or as needed. Wunder Hoof, Inc. is a Texas based, family owned and operated business. Wunder Hoof, (formerly known as the “White Medicine”) has been in our family for three generations. Wunder Hoof was created by my Granddad, a World Champion Racehorse trainer and Farrier in the early 1940’s. The many benefits of Wunder Hoof were quickly evident, and due to the competitiveness of the Racehorse industry, the Wunder Hoof formula would be kept a secret. The Wunder Hoof secret formula was then passed on to my Dad, who for over 40 years also trained World Champion racehorses. Over the years through word-of mouth, more and more people began to ask about the White Medicine, and how they could get it. The demand became so great we were unable to continue to give it away to close friends for free; we gave it a name and began selling Wunder Hoof to the public. For three generations our family has revolved around our love of horses and their well-being. We are proud to offer a high quality product that is affordable and truly beneficial to all horses and those who care for them! Some Users of the Wunder Hoof Product!